Not diggin’ the Gravity 3 form factor? Well T-Mobile has got plenty of choices for you heavy texters. 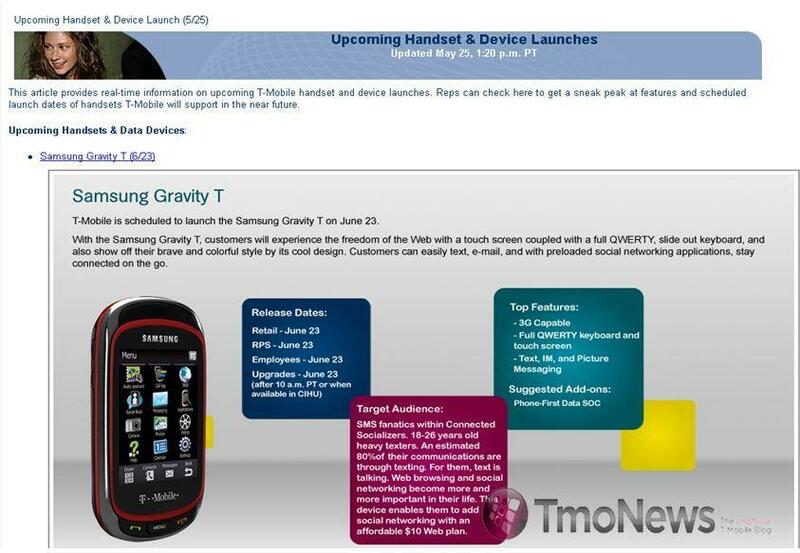 Pictured above, the Samsung T669 aka the “Gravity T” will also be available beginning June 23rd sporting a resistive touch screen, a full QWERTY keyboard with onboard Dolphin browser, 3G capability, and a 2.0 megapixel camera. The Gravity T seems like a handset for users that aren’t ready for a smartphone but want something more than the average dumbphone. We hear that this phone with also have an “optimized” version of Samsung’s Touchwiz interface. Next up is the Samsung T359, which Magenta oddly enough is calling the Samsung :) (we’re going to take a stab in the dark and assume that stands for the word “smile”). The T359 will be replacing the T349 and will house a 1.3 megapixel camera, full HTML browsing and oddly added in, active sync exchange mail support. The handset will also be launching June 23rd. So you will have not one, not two, but THREE choices. If only we could get as many high-end smartphones as we do dumbphones. Leave your thoughts in the comments! Two more crap phones. Come on T-Mobile, Get the Galaxy, dell 5, The HTC new phones with the snap dragon processors. Enough with the crap phones, there are plenty of low level phones, todays customers want high level phones that work on 3G network with no problems. Bring the best or stay home. Juan, do you actually have a phone with the Snapdragon processor? Of course it’s not faster than a desktop, I don’t know why you would even say that, but battery waster? No. And why are you bringing up Wimax? You replied to Vinny, buy I don’t get what it is you’re trying to argue. Vinny may be a bit off, in the sense that he definitely doesn’t speak for the entire customer base, but something that T-Mobile has failed to do over the years, even after changing up it’s game plan a little, is provide high end phones for the audience who wants them. That is the point he was making. The ‘high end’ devices on T-Mobiles network would ‘fit nicely’ as mid level smartphones on other networks, and whenever a high end or exclusive device debuts on T-Mobile, whether it be the Touch Pro 2, G1, or HD2, it is quickly overshadowed by something else. Why did we get the first Android phone, yet nothing but second rate models afterward? It all makes me wonder if T-Mobile even cares about the high end audience. I’ve stuck with them this long for the prices and customer support, and ironically enough, I have the best phone [not] on T-Mobile’s network, which is the Nexus One. If I hadn’t been patient enough to pick that up with the subsidized price, I most likely wouldn’t be here anymore. You are obviously out of touch with the majority of America my friend. There is still a huge piece of the population that would never use a phone for email & web purposes. These phones will fit nicely in Tmo’s lineup and end up selling very well. Tmobile has to get phones for everyone, they cant just focus on smartphones…. What’s next, that samsung =0? Maybe the <3, or even the :^$ ? 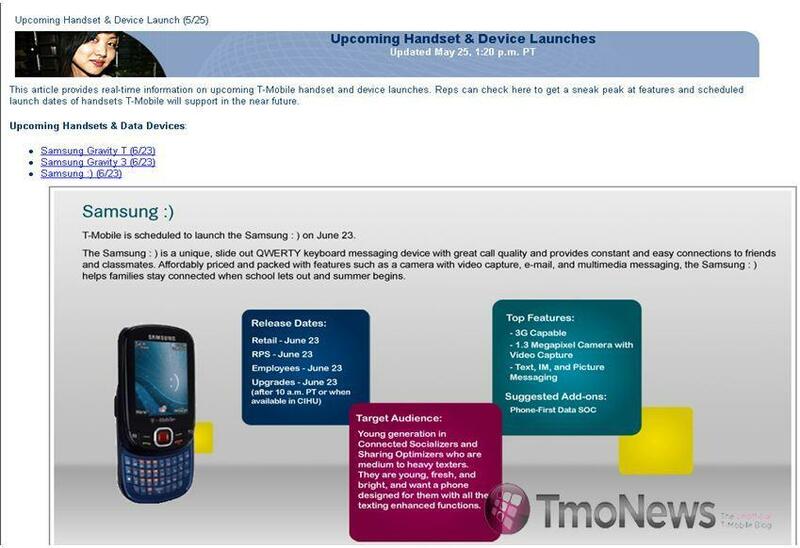 With any luck this means that the galaxy S will be launching at the end of June too. P.O.S phones , But nice find nonetheless, now theres hope for the Galaxy S.
For a phone like the Gravity T, does anyone if the $10 add-on web plan would be required. I know with smartphones for the most part the web or data plan is required to get the phone with a contract. but since this is not a true ‘smartphone’ does that mean it will optional? It will not be required for this phone, no. Come on Galaxy S! I need to upgrade my slow G1. It’s like the impression & flight on at&t. both very popular phones there. perfect for the target market. i was wondering when these would release. if they’re priced right, these phones are going to sell like hotcakes. oh but didn’t you hear the guy that said that t-mobile customers don’t want these low end junk phones. They ALL WANT high end 1ghz phones. he is saying that because he wants them then all customers want them. He fails to realize that there is a huge market for these messaging phones. gravity t is awesome! tmobile needs more touchscreen/keyboard phones that don’t require data! …and we get some neat entry level phones! Yes I understand this is what a lot of common consumers will buy, but it seems t-mobile already has a lot of these types of phones in their line-up…watch, two months after these are released they will announce some more entry level ones! These phones arent ment to be high end… at least not high end smart phones. They are high end dumb phones though. You forget how limited tmo’s line up of good keyboard dumbphones is. They dont have anything that competes with the touch screen dumbphones on every other carrier. Really, they just have the gravity 2 and comeback which are the same phone with a different form factor. This is a much needed phone segment as it is very popular on other carriers. That said, yea, they need a few high end smart phones. Actually, more people are buying smartphones these days than not. Trust me on that. The HD2 sells like wildfire because theres nothing else in its class on Tmobile. If they had the nexus or incredible or evo style android phone in store it wouldnt sell nearly as well. Its a great phone but people want high end android over windows. Nice phones that deliver a cool factor for non tech junkies and heavy texters. Tmo will deliver, its a painful slow wait, but they will bring some juicy android phones. Look for an anouncement in the middle of June. The Samsung smile :) (t359) looks exactly like the new Samsung Strive for AT&T. The only differences that I can see is the sides are chrome-ish and the buttons on the QWERTY keyboard are a different color. Everything else looks exactly the same through. From what I have been reading and surfing the net seeing is that the Samsung Galaxy S is coming sometime later this year to T-Mo which is great since T-Mo needs a high end phone. Yes the new myTouch 3G Slide has its place and really looks nice, but did does not fill the void that T-Mo has open for a extremely strong Android phone. Once T-Mo gets the Galaxy S they will be hard to stop. Just my two cents. Thanksfor sharing this with us!I trulylike this objectand you are given here really a superbinformation.Thanks.Keep it up.keep up the high-qualityworks.keep blogging. Does anyone know for sure whether this phone requires ANY data plan at all? That most likely will decide whether or not i get it, i do not want to pay ANY data plan at all, even if i lose rebates, i just don’t want a data plan. I was told that the phones don’t require a data plan by a Tmo Rep. It’s an optional feature on these phone, and only the $10 web2go month plan. Now to find out how much these phones will cost, I’m hoping free with qualifying upgrade, it’s the perfect phone for my kid. Is the $10 data plan optional? I just got my Samsung Smile about two, maybe three, weeks ago. I love it.